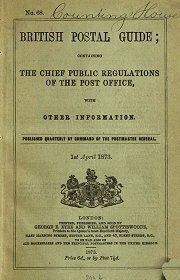 The Post Office Guide was the official guide to Post Office services, published from 1856 for the information of Post Office staff and the public (entitled the British Postal Guide until 1881). It gave postal regulations for inland and foreign mail, information relating to all Post Office services, and a list of current Post Offices, and was originally produced quarterly. Publication was partly by supplement during the latter stages of World War I and after; later the Guide was produced biannually and then annually.